One of the hardest things about having a baby is that your life is no longer your own. You would do absolutely anything for that baby, and in reality you do not mind sacrificing for baby. However, you would also really enjoy being able to consistently shower, or even just brush your teeth. A nap would be a dream! If you use a schedule for your baby, those wishes can become your reality for most days. It is never too early to enjoy the benefits of a baby schedule. You can see my babywise schedule we used from month one here. Baby schedules are not easy. Before you delve into the work associated with a schedule, it is helpful to know all of the benefits so you can cling to those when your days get rough. 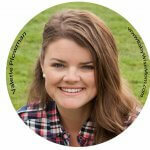 Guest post by Valerie Plowman. There are many benefits of a baby schedule. Some are benefits for baby, some are benefits for mom (or the primary caregiver), and some are benefits for the entire family. Sleep is helpful and vital to the physical, cognitive, and emotional growth of baby. if you have baby on a schedule, that will include regular nap times. Having those regular nap times really helps baby get the sleep baby needs. Instead of you waiting for baby to finally fall asleep, you help initiate sleep as the parent since you know sleep is part of the daily routine. Read more about the benefits of sleep for babies here. Not only does baby get sleep with a baby schedule, mom has the opportunity for sleep each day. If baby has consistent nap times, mom has a greater chance of being able to work a daily nap in, also. Even the best newborn sleepers wake up frequently in the night and disrupt sleep. Mom has just given birth and her body needs to heal. Sleep is a vital part of the healing process for the body. Getting sleep is also vital to helping prevent postpartum depression from setting in. Sleep is always easiest to achieve when it is regular and consistent. If baby takes regular naps, mom’s body can adjust to those regular naps and actually “sleep when baby sleeps.” Sleep is highly undervalued in the modern culture; it needs to be respected and given the credit it deserves. The body and mind process and heal during sleep. It is not selfish to try and get as much sleep as you can, especially as a mother. When you have baby on a schedule, your days can be predictable. That means you can make doctor appointments with more confidence. That means you can make lunch dates or arrange to pick the kids up from school. Babies are not robots; there will be off days even with your best efforts. However, with your best efforts, you can have predictability and consistency in your days. When baby is on a schedule, baby is getting consistent rest and food. This enables baby to be alert and aware during the time baby is awake. Baby can really take life in and learn when baby is awake because baby has gotten enough sleep. A baby on a schedule is a content baby. Baby knows what to expect and when to expect it. Baby will be less fussy because baby’s needs are typically addressed. There are times a baby will still fuss. A gassy baby or baby with reflux will fuss even if she is on a schedule. The beauty of this is that you can quickly rule out being tired or hungry as reasons for fussing. This enables you to recognize other possible reasons for the fussiness quickly. When your baby is predictable, you are getting consistent rest, and baby is content, you can fulfill more roles than that of “mother.” You can also be a wife, friend, daughter, neighbor, mother to other children, volunteer, etc. You don’t want to overextend yourself, but you will be able to actually extend yourself to others when baby is on a schedule. There are baby benefits to having a baby schedule. Sleep, predictability, contentment, and being present for others are all great benefits to having baby on a solid schedule. Those benefits of a schedule will continue to be obvious even as your child becomes older! Valerie, also known as The Babywise Mom, is the mother to four children. She has been blogging on Babywise and general parenting since 2007. She has a degree in technical writing and loves using those skills to help parents be the best parents they can be! Read her book, The Babywise Mom Nap Guide, to get help on sleep from birth through the preschool years. You can also find her writing at Babywise.life, Today Parenting, and Her View From Home. Read more about Valerie and her family on the About page. Follow her on Facebook, and Pinterest for more tips and helps.